I love chicken. I could eat it 4-5 nights a week if my husband would tolerate it. Which he won’t (party pooper). Chicken, roasted in the oven, skin left on and baked to a golden brown, reminds me of my mom. When I was in 6th grade I was a latchkey kid. Parents divorced, mom had to work two jobs, you know the story. So I was raised on a lot of convenience foods, but there was always Sunday when mom didn’t have to work and she would bake bone-in chicken breasts. She’d slather the skin with softened butter, sprinkle them with salt and pepper and bake. Delicious! I’ve grown up and mom’s been gone for just shy of 20 years now (I still can’t wrap my brain around that), but that memory is etched in my head forever. While I love the simple, tried and true baked chicken that mom always made, I like to experiment even more. Try different things and experience new flavors, or combine some well known favorites. This recipe for roast chicken combines lemon and thyme in a compound butter and roasts the chicken to juicy perfection. Served on the side is a fabulous au jus flavored by shallots, vermouth, broth, thyme and bay leaves. 1) Don’t trust your eye or the suggested time. Use a meat thermometer. Chicken should be 160-165 in the thickest part of the breast, or 170-175 in the thickest part of the thigh. 2) The au jus is just that, an au jus. It’s not a gravy. 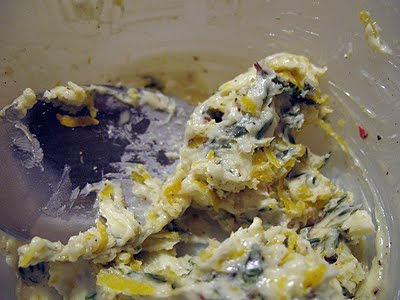 However, if you want a gravy, skip adding the lemon juice and whisk in a tablespoon of flour. Simmer and allow to thicken. I personally loved the au jus, dipping the chicken in it was Heaven. However, dipping your finger in to get a taste is an entirely different story. If you are unsure, leave the lemon juice out or use less of it. 3) If your V-rack is like mine, it was made for a monster turkey, not a little ole 4 pound chicken. To keep the bird propped up, crumple some foil and tuck it underneath. I had to do this at the wing end of the bird to keep it from falling through the rack. You can also use this method if you don’t have a V-rack. Wad the foil up into balls and prop the chicken up in a roasting pan. Combine 2 quarts of water with sugar and salt and submerge the chicken. Cover and refrigerate. Brine for a minimum of one hour, or up to 24 hours. Adjust oven rack to the lower middle position, place roasting pan on the rack, and preheat the oven to 400 F. Coat a V-rack with nonstick cooking spray and set aside. Remove the chicken from the brine, rinse well, and pat dry with paper towels. Use your fingers to gently loosen the center portion of the skin covering each side of the breast. 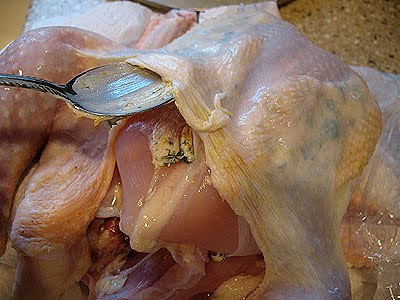 Use a spoon to place half of the butter mixture under the skin of one breast, placing the butter directly on the meat in the center of the breast. Do the same on the other side with the remaining butter. Gently press onto the skin to distribute the butter evenly over the meat. Rub the skin of the chicken with the oil, season with pepper, and place the chicken on its side (so that the wing is facing upward) onto the prepared V-rack. Place the V-rack into the preheated roasting pan and roast for 15 minutes. Remove roasting pan from oven, and using 2 large wads of paper towels, rotate the chicken so that the opposite side is facing up. Return to the oven for another 15 minutes. Using the 2 large wads of paper towels, rotate chicken so that the breasts are facing up. Add the chicken broth to the roasting pan and continue to roast until breast registers 160-165 or thigh registers 170-175 on an instant read thermometer (about 25-35 more minutes). Tip the chicken to let the juices flow from the cavity into the roasting pan, then transfer chicken to a cutting board and let it rest while you make the jus. Use a wooden spoon to scrape up any browned bits off the bottom of the roasting pan. Pour cooking juices into a fat separator and set aside to settle, about 3 minutes. If you don’t have a fat separator, skim the fat off the top with a spoon. Pour juices into a medium saucepan, stir in the broth, vermouth, bay leaves, shallots, and thyme. Simmer over medium-high heat until the liquid has reduced to about 1 cup, about 10 minutes. Strain the sauce and return it to the saucepan, discard the solids. Off the heat, whisk in the lemon juice* (see my note #2) and butter. Season with salt and pepper to taste. Serve warm with carved chicken. Use a wooden spoon to scrape up any browned bits off the bottom of the roasting pan. Pour cooking juices into a fat separator and set aside to settle, about 3 minutes. If you don't have a fat separator, skim the fat off the top with a spoon. Pour juices into a medium saucepan, stir in the broth, vermouth, bay leaves, shallots, and thyme. Simmer over medium-high heat until the liquid has reduced to about 1 cup, about 10 minutes. Strain the sauce and return it to the saucepan, discard the solids. Off the heat, whisk in the lemon juice* (see my note #2) and butter. Season with salt and pepper to taste. Serve warm with carved chicken. 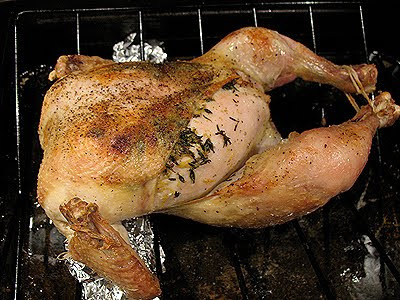 I have never brined a chicken (or turkey) but this looks so sluty, I mean tasty, that I'll have to try it! My heart still goes out to you for your loss of your mom at such a young age. Your love for her is so obvious and touching when you post recipes like this. And…. I LOL'd myself silly over your ability to photograph your chicky without making her look tramp-like…LOL! Looks delicious! Love all the seasonings. I love roast but have not done one myself. I only roast chicken legs so far cos my family does not like breast meat. Debbie – thanks for the invite, I'll check it out! Theresa – I hope you do, it's marvelous! cookies – I am totally sold on brining, and it's sooooo easy. Winnie – I love rosemary with chicken too, but hubby does NOT like it. So this recipe worked out perfectly. Lana – I'm a crispy skin fan too! Jennifer, Barbara, Sabrina – Thank you! Cathy – She's a tramp, it's true. Just sayin. Wow, this roast chicken must be so super flavorful with the brining and the compound butter, excellent! 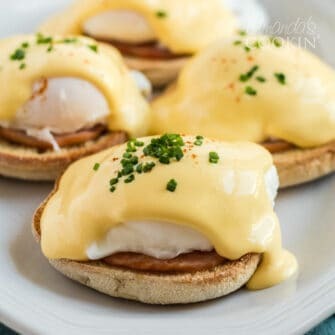 LOL I love your word play and love the connection this gorgeous recipe has with your Mum! 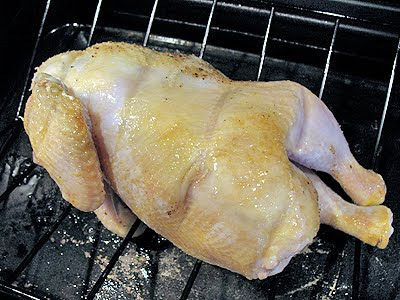 I'd love to gather the courage to roast a whole chicken…shall do so one day. Your's in very very nice… and bravo on the photography angles. Loved the banter!! This looks so yummy…haven't roasted a whole chicken in a long time. I'll definitely give this a try! Hey she does look a bit trampy in that last pic though, LOL. Love roasted chicken and these flavors sound delish!! Lemon complements the flavors of chicken so well, and I'll definitely find the "thyme" to make this. Many thanks for this lovely recipe. This looks delicious! It's a great flavor combination! 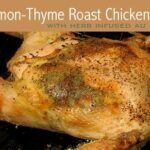 That combination of thyme, lemon and chicken just can't be beat! Now I'm craving some baked chicken. The crispy skin is my favorite!